Russian President Vladimir Putin has ordered stricter governmental measures to crack down on sales of surrogate alcohol, after dozens died from drinking a bath lotion. The death toll in the Siberian city of Irkutsk has risen to 62, with more than 30 people seriously ill.
Mr Putin also wants new rules for compulsory labelling, plus tougher penalties for bootleggers. The deadly bath lotion contained methanol, which is highly poisonous. 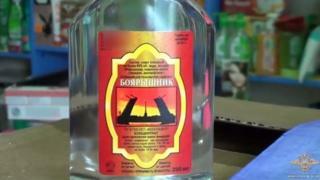 Analysts say up to 12 million Russians drink cheap alternatives to regular, drinkable alcohol. These are often labelled as cosmetics or medicines, and are regularly sold via vending machines. The presidential orders, published on the Kremlin website, call for tougher rules on all products containing more than 25% alcohol, and on the retailing of medicinal and veterinary products containing alcohol. Mr Putin also approved increasing excise taxes on surrogate alcohols, which would make them less profitable. The government has until July to create and submit the new legislation. The Siberian Times said the mass poisoning in Irkutsk was "now the worst such case in modern Russian history". Twelve people have been arrested in an investigation that has seen 1,500 premises searched and thousands of bottles of spirits confiscated. Investigators say the hawthorn-scented liquid carried warnings that it was not for drinking, but the label also said the product contained ethanol, rather than deadly methanol, which can also cause blindness. Russian Prime Minister Dmitry Medvedev has ordered his cabinet to "sort out" the problem of selling such alcoholic products not intended for drinking. Mr Medvedev called their widespread sale through vending machines "an absolute disgrace". Health Minister Oleg Yaroshenko said that almost half of those still being treated are not expected to live and were in a very serious condition. "They came to [the] doctors too late.... Only a miracle can save them," he was quoted by the Siberian Times as saying. The paper said that a doctor and a kindergarten teacher were among the victims and that many of those who died were discovered in their homes because they did not have sufficient time to call an ambulance. Most of the victims are reported to be aged between 35 and 50. One 33-year-old survivor said that he only drank a small amount of the lotion but still woke up blind the following morning.